The Non-Crafty Crafter: Welcome to National Scrapbooking Day weekend! With Glittering Eyes blog - 8AM EDT Saturday, May 4, 2013 "It's All About Perspective" Tutorial and Blog Prize - $20 Hobby Lobby Gift Card! 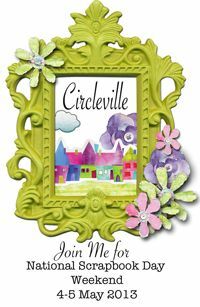 Around the Block with Scrapalette blog - 11AM EDT Saturday, May 4, 2013 "Tic Tac Toe Challenge and Blog Prize! Col's Creative Corner - 1PM EDT Saturday, May 4, 2013 "Ease on Down the Road" Blog Prize- $15 Michael's Crafts Gift Card! Paper, Craft, and Scissors - 3PM Saturday, May 4, 2013 "On Pins" theme and Blog Prize - $25 Simon Say Stamp Gift Card! Stamp, Cut, Create!- 4PM EDT Saturday, May 4, 2013. "Tin Is In" theme and Blog Prize! All Scrapped Out - 6PM EDT Saturday, May 4, 2013 "What's It Owl About" theme and Blog Prize! Scrappin With the Bug - 10PM EDT Saturday, May 4, 2013 "The Crazy Bs Challenge" and Blog Prize! Sara W. Andrews - 9AM EDT Sunday, May 5, 2013 "Go Big or Go Home Challenge" and Blog Prize - $20 Hobby Lobby Gift Card! Scrappin With the Bug] - 11AM EDT Sunday, May 5, 2013 "Tropical Sunset Color Challenge" and Blog Prize! I Came, I Saw, I Created - 6:30PM EDT Sunday, May 5, 2013 "Did-I-MENSION???" Challenge and Blog Prize! Happy Crafting!! Hope to see you! Can't wait to see your tutorial!!! Okay! This makes sense to me. I am going to work it out on my Gypsy next week. You do explain things so well!!! !